Renowned scholar, ustaz, murshid of Shazily and Naqshbandi tariqahs, honourable Shaykh Said Afandi al-Chirkawi was born in 1937 in the Dagestani village of Chirkey in the family of 'Abdu Rahman. It was time when dark clouds gathered over Islam and Muslims, for the enemies of Islam killed thousands of Islamic scholars (may Allah be pleased with them) including such well-known scholars like Shaykh Hasan Hilmi Afandi and Shaykh Muhammad Afandi Ya'subi. In this difficult period by the grace of Allah, a boy was born in the village of Chirkey. They say, that it has happened at the time the fate of human being was being determined. It was the noble night of Sha`ban when Said-Afandi (may Allah bless him) was born. Subsequently, by the will of Allah, through communion with him thousands of murids found true happiness. On this important occasion Said’s father read surah “Yasin” three times, appealing to God with supplication that his son would be firm on the path of Islam and never turned aside from it and that he would become a scholar who would teach faith to new generation, for it was hard time where hostile trends towards Islam were gaining momentum with each passing day. Verily, in the night of Laylah al-Bara'a of the middle of Sha'ban, named as the month of the Prophet (peace be upon him) when the grace and mercy of God are sent down, God heeded Said-Afandi father's prayers. Said-Afandi’s mother, 'Aisha (may Allah have mercy on her), while waiting for the birth of her son, told of unusual dreams. She saw dreams how she with her baby's cradle soars into the sky and looks from there down at the towns below that resembled anthills. Later she said the birth of her son was both easy and completely painless. Often his father putting Said into his cradle used to read in a child’s ear surah “Al-Fatiha”, and his son listened attentively looking at his father. Seeing his good temper which manifested itself already in the first months of his life, the father said that he would probably grow up as an unusual person. From his early childhood Said was surprisingly calm, patient and intelligent boy. The naughtiest boys were careful to quarrel with him or to engage in conflicts. He never caused anger or resentment, even among children. Even as a child he saw uncommon and wise dreams. Once women returning from the collective farm met him in one of the streets and offered him bunch of grapes. But he refused it. When this came to be known to his relatives they asked him why he did not take grapes. Said explained the grapes were unlawful (haram). Once upon returning from the village of Gelbakh where he went for buying some wheat, Said found few seeds accidentally caught in his shoe. Having discovered them he intended to go back arguing that he should return the seeds to the owner. His relatives barely managed to keep him at home as night has fallen outside. Said always treats the elder with great respect and is equally kind and affectionate to the younger. He never entered into disputes that could lead to conflicts, and even if someone is wrong he always concedes and gives way. Said-Afandi (may Allah be pleased with him) has an honorable and modest personality without any desire for fame and never breaks his promises. Said-Afandi’s father had a great aspiration to give his son an Islamic education. But he died from a sudden illness (may Allah soothe his soul in Paradise) when Said was seven years old. It happened on that day and hour when the boy reading Quran reached the surah "Yasin”. Left as orphan, but with the support and perseverance of his mother, the boy accomplished reading of the whole Quran, despite all difficulties. Upon completing seven years of school education he had to graze village herds of sheeps to provide for his family. Four years later he was drafted into the armed forces where he served as an operator in the air defense forces. For three years in the army, overcoming all the hardships he never missed any prayer or fast and did not eat any haram food. After graduating from military service and returning to his native village, Said again had to work as a shepherd, leading flocks of sheep through the mountains. But even there, on the mountains, in any weather of a blizzard, snow, rain and wind, he every time had taken ablution, pronounced the azan (call to prayer) and performed the prayer. During all these years he suffered greatly recalling his father's wish to see him as an `alim (scholar). Every time when love and thirst for knowledge had suddenly overwhelmed him he wept bitter tears standing in front of the herd while asking Allah for an assistance to grant him religious knowledge. However, the constraints of means of living and the need for family support forced him to remain as shepherd. In his late twenties he managed to leave his job to continue studies. At that time an important event took place in his life. He became a follower of the Shazily tariqah. Fortunately, despite the difficult and dangerous times, scholars Islam Haji, son of Jacob, and Haji son of Patal, taught him religious knowledge. That time Said was already a mature man, and overcoming all difficulties and possessing great talents gifted from God, he was successfully moving towards his desired goal, steadily and confidently progressing in gaining religious knowledge. Owing to the sharp and penetrating intellect, sensitivity, excellent memory granted to him by Allah he knew any book he studied as if he was its author. Many Murshids foresaw his fate. For example the tariqah Shaykh Abdul-Hamid-Afandi from the village of Inkho used to ask his murid Muhammad Haji, son of Shamkhal, from village of Chirkey: "There is a house at the borders of your village in which a blessed orphan lives. How is he?" He is said to have posed the same question to many Chirkeians. It was true because the house of Said-Afandi was on the village outskirts. Muhammad Arif-Afandi often used to tell his murids: "My children, the Prophet’s hair is kept in Chirkey. One day it will be apparent to all." One of the best qualities of Said-Afandi is his good temper. He had never refused to help anyone. He possesses both patience and gentle manners. Often, while having started construction of his house, he had to leave his work and cement mortar to dry, in order to hurry to solve people’s problems. One day, along with fellow villager 'Abd al-Rahman, son of 'Ali, he came to the village of Nechaevka to visit his Shaykh Muhammad Afandi. The teacher said to him: "Said, my son, my strength is on the wane. I've been thinking who will be the successor after me, so I absorbed in meditations and asked Allah about it. He revealed to me the name of the one who will be my successor. I know your knowledge and deeds have reached perfection. Now I give the permission to you, from now and on you're going to keep it." Said-Afandi’s eyes filled with tears, his face full of sweat, and he begged his Shaykh not to impose such a serious matter on him. However ustaz did not even want to hear these pleas, saying that a decision for preceptorship (ijazah) is not granted by someone's wish and likewise not withdrawn if someone does not want to teach people. It was not the sole ijazah he received. Qutb from Batlukh Muhammad, son of Sa'adu Haji, sent ustaz Muhammad-Afandi with Khasmuhammad into Chirkey to transmit the order (amr) of the preceptorship to Said-Afandi. Along with instructions they brought him both the preceptorship seal and the gown (khirqa) that are passed from ustaz to ustaz in chain (silsilah). There are many amazing things in the life of Said-Afandi. But his biggest miracle (karamah) is istiqama or his constancy in the following the true way ordained by Allah. Despite the huge number of murids who come to him for advice and myriads of problems, nobody ever heard or saw him saying a word or committing any act contrary to the Shari`a and Tariqah. Books written by him in a short time prove religious comprehension and deep knowledge of Said-Afandi. A person who has completed only seven years in school, and whose life was spent on mountain pastures, in the poetic form (nazmi) gives the Shari`a view, narrates history of the religion and the prophets. He is the author of nine books (three of them in prose), many of them translated into Russian and other languages. These works prove high level of his religious knowledge. 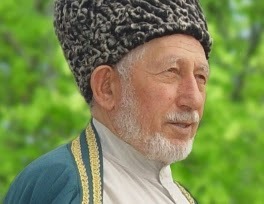 Many prominent scholars of Islam agree that the history of Daghestan theologians ('alims) has never had anyone like him. When the Shaykh Muhammad Haji of the village of Batlukh read his works for the first time he said that Said is in the second place after 'Ali Haji of Inkho. But when the first book of Said-Afandi was published the Shaykh said that now he gained the first place. You know, Lord, I am a student - always. if not for fear that it would be in vain. and he who seeks, will find here a lot. Shaykh Said Afandi passed away as a martyr, killed by a female suicide bomber on 28 August 2012 in his house. May Allah Almighty bless the soul of the honorable Shaykh Said-Afandi and bestow happiness of both worlds, on his family, relatives and all those whom he loves and who loves him! Amen!